Use this guide to help you develop integrated applications with SwitchYard. Business Process Execution Language (BPEL) is an XML-based language that enables task-sharing in a distributed computing environment. It uses easy-to-understand commands that perform complex functions. All the processes in BPEL, export and import information by using web service interfaces only. The BPEL Engine is optimized for the JBoss Application Server container. It is based on Apache Orchestration Director Engine (ODE) and manages process definitions and instances. BPEL (based on the Riftsaw project) is no longer being actively developed and will be removed from a future release of JBoss Fuse. If you are currently using BPEL, it is recommended that you consider migrating to the Red Hat JBoss BPM Suite (which is supported through the JBoss Fuse Integration Package). Business process orchestration refers to the act of specifying actions within business processes via web services. BPEL is mainly used to model web service interactions on a distributed system. It allows for complex orchestrations of multiple service applications through a single controller service. Provides BPEL component within the SwitchYard. Enterprise quality GWT based BPM console to manage process definitions and instances. Compiled approach to BPEL that provides detailed analysis and validation when deployed. Short-lived and long-running process executions. The BPEL Component is a pluggable container in SwitchYard that allows you to expose a WS-BPEL business process as a service through an interface defined using WSDL. For SwitchYard BPEL applications, the artifacts within the src/main/resources folder are structured differently. The switchyard.xml configuration file is located in the META-INF folder. However, the BPEL deployment descriptor (deploy.xml), and the BPEL process definition are located in the root folder. You can locate the WSDL interface definitions, and any accompanying XSD schemas in the sub-folders. You must ensure that the BPEL process and SwitchYard BPEL component configuration define the correct relative path for the artifacts. Define your process using WS-BPEL within JBoss Developer Studio (with JBoss Integration and SOA Development tooling installed). Define a WSDL interface for the BPEL service. Define a Deployment Descriptor using the ODE Deployment Descriptor editor bundled with JBoss Tools. Add the component containing the implementation and service interface to the SwitchYard configuration. The BPEL component contains a single implementation.bpel element that identifies the fully qualified name of the BPEL process. This component may also contain one or more service elements defining the WSDL port types through which the BPEL process can be accessed. Here, the usePeer2Peer property informs the BPEL engine not to use internal communications for sending messages between BPEL processes that may be executing within the same engine, and instead pass messages through the SwitchYard infrastructure. The BPEL Console is a web based interface to manage, administer and debug processes deployed on a BPEL Server. It enables you to run, test and manage BPEL processes. A BPEL Process Definition is an XML file that acts as a template for a process. When deployed as a part of the SwitchYard application, you can access the BPEL process through various bindings supported by SwitchYard. For instance, as a web service via the SOAP binding or via a JMS queue. The BPEL process definitions are deployed as a part of the packaged SwitchYard application. When deploying the SwitchYard application, ensure that it contains one or more BPEL process. All the BPEL processes are displayed under the list of deployed process definitions in the console. Launch a web browser and navigate to http://localhost:8080/bpel-console. Click on the Runtime tab. Select the Deployments option. You will now be able to see the version information and current status (active or retired) of each process definition. Check if there is any active process consisting of any unfinished instances, retire the process. Undeploy the process only when there is no active process instance. Undeploy the BPEL process only when the containing SwitchYard application is undeployed. An active process instance is one execution of a process definition. When you select a process definition, BPEL console displays the list of active process instances for that particular process version and definition. Click on the Managed Instances tab to see which BPEL processes are currently deployed. The process version information for each of these processes is also visible. Only one version of a process can be active at a time. When you open a process definition, the active version is automatically selected. BPEL console enables you to select a different version of a process. The Business Process Analytics Format (BPAF) is designed to provide you with information about the efficiency and effectiveness of your organizational processes. It is an XML-based interchange format for all the process audit events. Select a process definition to open it. Use the Execution History to produce a chart. Here you can specify a particular period of time to review and choose whether or not to include failed and terminated instances in the chart. Open the deploy.xml file in a text editor. deploy.xml file exists with every BPEL deployment unit. Add the process-events element to generate all the events. For more information, navigate to the Apache ODE events http://ode.apache.org/ode-execution-events link. Under the Managed Instances tab, select the Open Button list to view the deployed process definitions. When you select any one of the process, it displays the list of process definitions and version of that particular process. Select a process instance to open it. You can see its details in the Execution Details panel. Click the Instance Data button. It displays all the details about the process. Click the Execution Path button. It opens the related instance execution graph. The instance execution graph is a visual representation of a running instance of a process. It tells the user about the process instance's performance over time. The View tab shows the instance execution graph, while the Source tab below it shows all of the "activity" events. Log into the BPEL Web Console. Choose a process definition and a process status from the list box. You can also optionally choose to input the correlation key, the start time and the end time as search criteria. Go to the History Instances List and double-click on a row. A window will pop up showing you all of the execution events that happened when that process ran. When you deploy the first version of a BPEL process definition, it automatically becomes the active definition. If this definition is subsequently changed and redeployed, then that version is "retired", and a new version becomes active automatically. If the active process definition is changed and redeployed, the old version is "retired". The new version automatically becomes active. The only difference between an active version and a retired one is that a retired one can no longer create new process instances. However, if there are active process instances associated with the retired process version, then these will continue to run. Launch a web browser and go to http://localhost:8080/bpel-console. Input your user name and password. You will now be able to see the version information and current status (active or retired) of each process definition. Select the particular version of the process definition you want to retire and then press the Retire button. If you undeploy a process, its end-points will only deactivate if no previous versions of that process have ever existed. The BPEL Engine generates events to let you track all the activities happening within the engine and produces detailed information about all the process executions. These events exists in the database and can be examined. When you run a process, Apache ODE generates a set of events. To achieve the satisfactory performance, you can deactivate few events that are not in use. All the events may cause a non-negligeable overhead. Add <process-events generate="all"/> parameter in the deploy.xml file. To enable the BPEL Engine to run in a clustered environment, you need to configure all the nodes within a cluster. Ensure that all the nodes have access to the shared information concerning the persistent state of process instances. For setting up a cluster, you need to employ a load balancer to distribute the incoming SOAP requests appropriately across all of the nodes in the server. In Fuse 6, the BPEL process is deployed as a part of a SwitchYard application. Therefore, the support for clustering is provided by SwitchYard. The switchyard.xml configuration file is located under the META-INF directory. When you invoke the BPEL service deployed in a clustered environment, make sure to specify the load balancer URL instead of SOAP address in the WSDL file. The load balancer then decides about the server, to invoke in the cluster. This is a list of Restful services that are used by the BPEL Console. 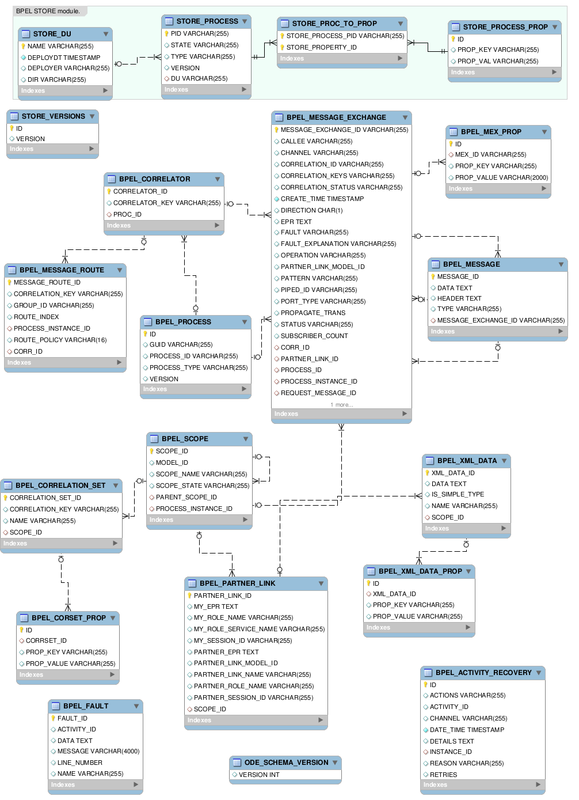 Following is the BPEL database schema entity relationship diagram.